You think the story is over, don't you? But wait! Fate takes a hand. Wait for The Unexpected! For mystery fans, The Unexpected is a real discovery. First aired in 1947, this unique and little-known quarter-hour series offers tense and suspenseful tales centering on the thoughts or actions of a person thrust into a difficult or dangerous situation. The stories are engrossing, but the most fascinating element is the twist ending that comes with each program - a surprise wrap-up that you'll never see coming. 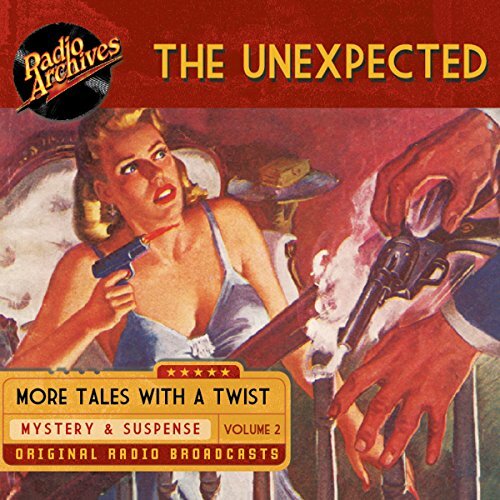 Transferred directly from original transcription recordings and fully restored for sparkling audio fidelity, The Unexpected, Volume 1 features such stars as Barry Sullivan, Tom Neal, Jack Holt, and Lurene Tuttle. You think the story is over, don't you? But wait! Fate takes a hand. Wait for The Unexpected! For mystery fans, The Unexpected is a real discovery. First aired in 1947, this unique and little-known quarter-hour series offers tense and suspenseful tales centering on the thoughts or actions of a person thrust into a difficult or dangerous situation. The stories are engrossing, but the most fascinating element is the twist ending that comes with each program - a surprise wrap-up that you'll never see coming.